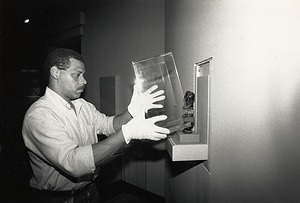 Established in 1964 by private collector Warren Robbins, the Museum of African Art in Washington, DC, was transferred to the Smithsonian in 1979. 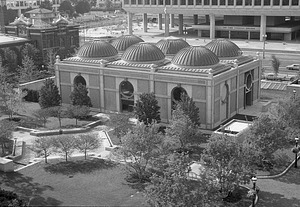 In 1981, the Museum was renamed the National Museum of African Art and in 1987, re-opened in a new building as part of the Smithsonian’s Quadrangle complex. 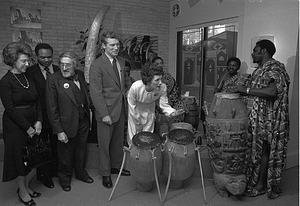 Mrs. Walter [Joan] Mondale playing the drums after a press conference at the National Museum of African Art (NMAfA) with, (l-r), Rep. Lindy Boggs, Rep. Walter E. Fauntroy, Warren Robbins (founder of the Museum) and Sen. Wendell Anderson. 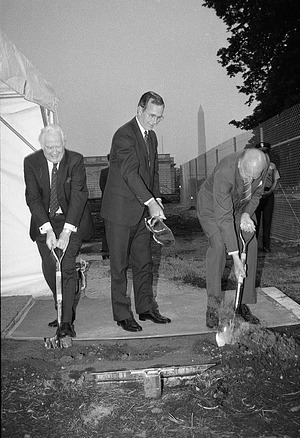 Chief Justice Warren E. Burger, Vice President George Bush, and Secretary S. Dillon Ripley at the groundbreaking ceremony for the Quadrangle Complex, June 21, 1983. The Washington Monument is visible in the background. View of the Smithsonian Institution Building (SIB), or "Castle", during the Marine Corps Marathon. The marathon runners can be seen passing in front of the Castle on Jefferson Drive. The Arts and Industry (A&I) Building is visible on the left side of the photograph. The Freer Gallery of Art (FGA) is visible on the right. Behind the Castle the early signs of construction of the Arthur M. Sackler Gallery and the National Museum of African Art (NMAfA) are visible. 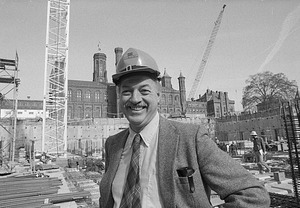 In 1984, ninth Secretary Robert McCormick Adams, wearing a construction hat, checks the construction of the underground museum complex that will houses the National Museum of African Art, the Arthur M. Sackler Gallery and S. Dillon Ripley International Center. The complex opened three years later. 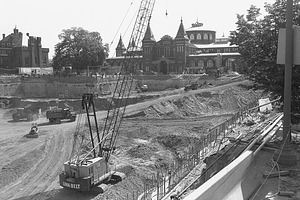 The Smithsonian Institution Building, or "Castle", is visible in the background along with cranes and other construction machinery. 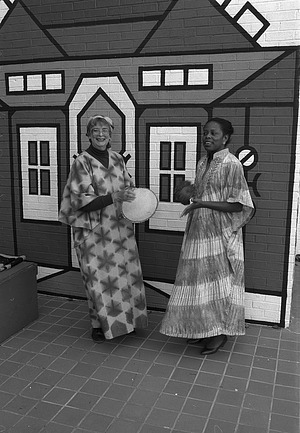 Carolyn Schirmer (l.) and Maxine Orwenyo in the National Museum of African Art (NMAfA) courtyard, wearing traditional African dress, demonstrate how they make music a part of their textile program for the elderly. Excavation in preparation for construction of the Smithsonian's $73.2 million underground complex on the Quad to include the National Museum of African Art, the Arthur M. Sackler Gallery, and the S. Dillon Ripley International Center. The Arts and Industries Building is in the background, and on the far left in the background is the Smithsonian Institution Building, the "Castle". The National Museum of African Art is under construction. 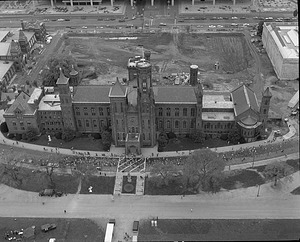 The photograph, taken from the top of the Smithsonian Institution Building, shows workers adding copper covering on the domes and the pink granite on the sides of the building. 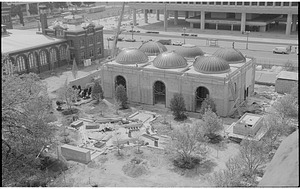 The hexagonal patio in the foreground, still under construction, will be the centerpiece of an Islamic garden with a waterfall, central water jet and seating walls shaded by eight hawthorn trees. A portion of the Arts and Industries Building is also visible in photograph. 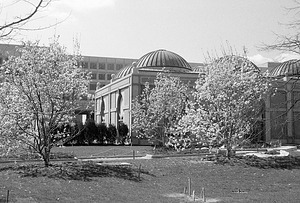 Looking at the National Museum of African Art (NMAfA) from Enid A. Haupt Garden, showing the Museum's pavilion with magnolia trees blooming in the foreground. The paths in the garden are still under construction. Ribbon cutting ceremony for the inauguration of the Smithsonian Institution's two new museums: The Arthur M. Sackler Gallery (Asian Art) on the left with pyramided roof, and the National Museum of African Art with domed roof on the right. Hundreds of people crowded the Enid A. Haupt Garden which sits atop the underground museums. This photo was at about 12:25 p.m. as 2,500 blue and yellow balloons filled the sky over the National Mall in Washington, D.C., September 28, 1987. Visible to the left behind the Sackler is the copper-domed kiosk which is the public entrance to the S. Dillon Ripley International Center located on the third and deepest level of the complex, the Quadrangle. 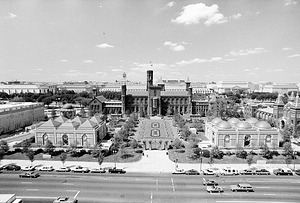 In the center is the Enid A. Haupt Garden with the Smithsonian Institution Building behind. View of the domed-roof pavilion entrance to the National Museum of African Art (NMAfA) located south of the Smithsonian Institution Building (SIB), or "Castle," in the four-acre Enid A. Haupt Garden on Independence Avenue at 10th Street, S.W. This museum together with the Arthur M. Sackler Gallery (AMSG), and the S. Dillon Ripley International Center form an underground complex which opened September 28, 1987.
iew through a window in the National Museum of African Art (NMAfA) of the South Tower and the Flag Tower of the Smithsonian Institution Building (SIB), or "Castle." The new museum opened September 28, 1987. 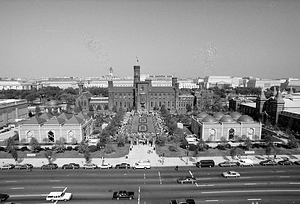 Overall view of Quad and the pavilions of the Smithsonian Institution's two new museums: On the left the Arthur M. Sackler Gallery (Asian Art) (AMSG) with pyramided roof, and on the right the National Museum of African Art (NMAfA) with domed roof. 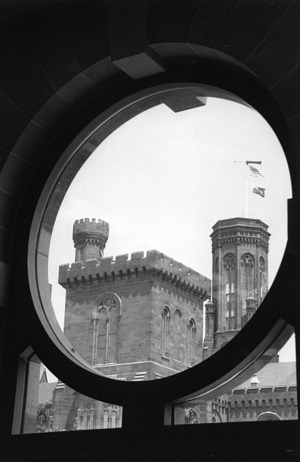 In the center is the Enid A. Haupt Garden which sits atop the underground museums with the Smithsonian Institution Building (SIB), the "Castle," in the background. Visible to the left behind the Sackler is the copper-domed kiosk which is the public entrance to the S. Dillon Ripley International Center (RC) located on the third and deepest level of the complex. On the far right a portion of the Arts & Industries Building (A&I) and on the far left a portion of the Freer Gallery of Art (FGA) are visible. 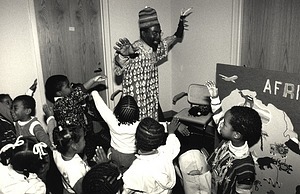 Docent James Brown, Jr. introduces young visitors to the art of Africa at National Museum of African Art (NMAfA). With the help of his puppet friend Kaboundi Gazelle, Brown helps children investigate shapes, learn games, play music and listen to folk tales. 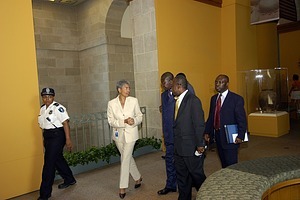 The Asantehene or Ruler of the Asanti Kingdom visits the National Museum of African Art, accompanied by director Sharon Patton. 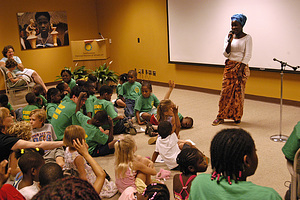 Beatrice Birra tells stories to audience at the National Museum of African Art.